· Reverses/prevents aging and increases longevity. · Removes fatigue and stress from work and life overall. · Nourishes the body and promotes sturdiness. · Oil rubbed into the skin prevents dehydration and strengthens the nerves. · Stimulates antibody production and thus strengthens the immune system. *It is best to wait at least an hour before taking a bath to let the oil nourish and detoxify all the tissue layers. Abhyanga with herbal oils infused with aromatherapy essential oils. Vishesh means special. This is a deeper version of Ayurvedic Massage, done with warm herbal oils. Vigorous and rhythmic strokes are used to remove adhesions in the muscle and connective tissue. It is helpful for soothing sore, tired or aching muscles, stiff joints. It dissolves and cleanses ama (toxins) from the tissues, improves blood circulation, helps in joint mobility and lymphatic flow. Balancing for Kapha and Pitta Doshas. Extremely relaxing and calming poultice treatment. Lavender is said to open the third eye and induce inner vision. The whole treatment helps to relax, promote circulation, lymphatic drainage, relieve muscle pain, jet lag. 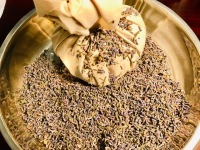 Lavender flowers and Himalayan salt poultice is dipped in warm herbal aromatherapy oils and rubbed in gentle strokes all over the body with a combination of Abhyanga massage. The treatment finishes with rejuvenating head and face massage with aromatherapy oil. The heated muslin parcel of aromatic herbs and spices (popularly known as Elakizhi in Ayurveda) is a heavenly Ayurvedic treatment. It is unchanged since ages and is still used to alleviate pain by opening the pores and bringing a medicinal heat to the muscles to induce relaxation. This is an ancient Ayurvedic treatment, featuring a dry lymphatic skin brushing with a silk glove, followed by herbal oil treatment. The brushing (gharshana) increases circulation, cleans the skin and stimulates the removal of accumulated toxins, so herbal oil treatment penetrates deeply. In Abhyanga Massage, oils and strokes are chosen according to body type and body condition. Some of the benefits of abhyanga are: Reverses, prevents aging and increases longevity. Removes fatigue and stress from work and life overall. Promotes good vision. Nourishes the body and promotes sturdiness. Relieves insomnia. Oil rubbed into the skin prevents dehydration and strengthens the nerves. Stimulates antibody production and thus strengthens the immune system. This treatment manipulates and massages various marmas or energy pressure points in the body. The Marmas are said to be the junctions of body and mind. Abhayanga massage is done on these points with specific massage oils or powders based on the constitution of the person. In Ayurveda traditions, Kansa Vatki massage is practiced as a daily ritual. Special herbal oils and essential oils are also used for specific healing effect. This treatment helps in reducing general pain and inflammation; proper functioning of immune system; relieving headaches and insomnia; relaxes tired feet; improves joint mobility; relieves eye strain. It also helps in balancing the bio-energetic principles (doshas) of Ayurveda that regulate body functions. Chakras, the seven energy centers are aligned along the spine and are responsible for dispensing energy to all the body's tissues through 72000 separate channels. These energy centers are the basis of all the Yoga systems. When Chakras are balanced, we feel healthy and capable, but when out of balance, they are the cause of ailments. This treatment starts with very low pitch Chakra chanting and then followed by a subtle head massage to balance the Chakras. Ayurvedic Massage oils, essentials oils and colorful Chakra gemstones are used for this treatment. Chakra balancing helps regulate the body from behind the nervous system. Some of the benefits are - balances body's life energy, brings a great sense of self, positive energy, positive feelings and deep relaxation. 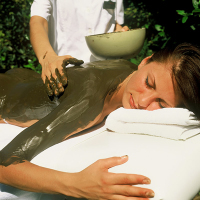 Shila-abhyanga is Ayurvedic version of Hot stone Massage. It starts with body oil massage and then followed by a hot stone massage. Heated stones are rubbed all over the body. 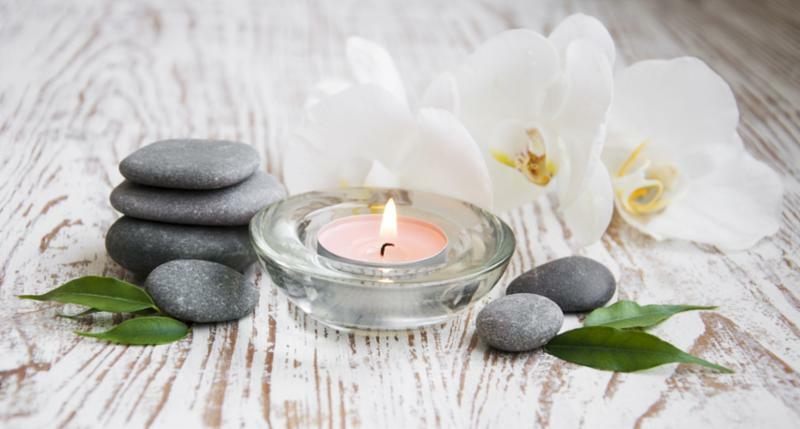 Stones also help penetrate the oil deep in the tissue, open the pores and relax the tissue. Few of the benefits of Shila-abhyanga are - Relieves pain and moisturizes, hydrates and detoxifies the body tissue; Cleans, tones and conditions muscle tissue; rejuvenates, exfoliates and beautifies the skin tissue; helps in conditions like - spondylitis, sciatica, upper and lower back pain. Enjoy an increased sense of tranquility and well- being with Himalayan salt stone. 100% pure Himalayan pink salt stones are rich in 84 naturally occurring minerals and elements that revitalize the body. Few of the benefits are: Negative ions are produced when heated creating a sense of peace and deeper sense of relaxation; the heat of the salt stones helps to loosen the joints; detoxify and alkaline the body; increase blood circulation; reduce inflammation; improve sleep; clear prana and energy; Improve overall sense of well-being. The practices of massage, yoga asanas and meditation help in the proper development of the fetus. Pre-Natal Abhyanga also provides relaxation, promotes flexibility and facilitates an easy delivery. A woman’s body undergoes a lot of physical and mental strain during the process of delivery. Postpartum massage helps the new mother’s body to recognize itself and to relax, thus promoting a quick recovery. Regular massage with oil can help the muscles regain their natural shape after delivery. Indian head massage is a unique treatment. It concentrates on the head, neck and shoulders, which are important energy centers within the body. The effects are not just physical but on the emotional level as well by calming the spirit, promoting relaxation and relieving stress. In addition to healthy hair growth, other benefits of Head Massage include more restful sleep, more energy and mental clarity and improvement in concentration. A very stimulating massage of the lower legs and the feet to activate the acupressure points. It is very soothing to the eyes, alleviates burning of the eyes, induces deep sleep, improves luster of the skin, smoothens cracked skin of the feet, relieves tiredness of the feet. Make your skin glow and shine with this facial treatment. Special cooked rice, rice water and herbs decoction are used in this Rejuvenating facial massage treatment.. Benefits are: detoxify and rejuvenate the skin, better skin tone, supple skin, anti-aging, stress relief, help for dark circles, increase collagen, help with TMJ problems, blocked sinuses, headaches. Finish with rice water+Himalayan clay mask. This is simpler version of the Rejuvenating Rice & Herbs Facial Treatment. It starts with cleansing and continued with rice poultice massage. Finish with rice mask. Perfect add on for a quick facial treatment. Benefits are: detoxify and rejuvenate the skin, better skin tone, supple skin, anti-aging, stress relief, help for dark circles, increase collagen, help with TMJ problems, blocked sinuses, headaches. This treatment is designed for total relaxation and skin rejuvenation. Herbs are used to deeply exfoliate the skin and then followed by a facial massage. Facial massage tones the cheeks and smooths away laugh lines and wrinkles on the forehead. You will finish up with an invigorating steam and customized mask. Extractions are included in the package. Rose, honey and sandalwood are highly prized for skin care and aromatherapy. This facial helps you get a velvety, smooth skin with a radiant glow. Relaxation comes as a bonus! Aloe vera is said to be a magic formula for most of the skin conditions. It does wonders to the sun-exposed skin. In short Aloe vera is hydrating, moisturizing and rejuvenating. Fresh Aloe vera leaf gel and organic Aloe vera juice are used in this treatment. It will be a great treat for all, especially for conditions like- sunburns, acne, eczema, anti-aging. We customize this facial by adding other ingredients, like- cucumber, lime juice, mango pulp, honey, rose water. Red lentils, rich in protein, provide extraordinary exfoliating and skin brightening results. This facial is beneficial for all skin types; great results in cases of acne, blackheads, whiteheads, scars, tanned skin, dull skin, large pores, uneven skin tone, anti-aging. Skin feels smooth and soft. This facial is customized for each person by adding other ingredients as needed, like- orange peel, sandalwood powder, rice flour, cucumber juice, tomato juice, milk, yogurt, lemon juice etc..
Amla (Indian gooseberry) is rich in Vit C and anti-oxidants, which helps in bringing the natural glow to the skin and lightens the dark spots. It's very effective in treating dry and dull skin. Due to the excessive presence of Vit C in Amla, it helps in the production of collagen cells in the skin which further works on restoring the soft and firm skin and prevents sagging. Papaya contains vitamin A in high concentration, which helps protect skin from the damaging effects of free radicals and reduce the signs of aging. It also contains an enzyme called papain which helps break down inactive proteins, so it gets rid of dead skin cells to leave the skin smooth and radiant. It also helps lighten age spots, get rid of wrinkles, and unclog pores. Amla-Papaya-honey mask in the end, will nourish the skin and provide moisture boost as well. Benefits of the Amla-Papaya-Honey Facial: Exfoliates the skin to improve its tone & texture, treats hyperpigmentation, reduces fine lines, skin brightening, activates cell regeneration, treats acne, improves skin’s hydration & detoxifies the skin in a gentle way. Serves as an Anti-aging maintenance and for skin brightening. Honey, Cucumber and Lime enjoy an age-old reputation as skin healers, softeners and moisturizers. These three ingredients, when used together, reduce the discomforts of skin irritations, while promoting new cell growth. This simple and sensual facial will leave the skin soft and plump. This facial is a winter treat to the skin and ingredients are fresh and good enough to eat too: Coconut milk, runny honey, almonds powder and milk, rose water. Coconut is considered a divine plant in Vedic tradition and is a great softener, moisturizer and wound healer. All these ingredients put together in this facial work wonders on dry, chapped skin in winter. Invigorating Coconut foot scrub and massage can be added on when the face mask is on. The end result is softer skin, cell renewal, natural glow to the skin and absolutely relaxed soul! Aloe vera, mint, neem have been used for centuries to keep acne and other skin problems away. These nutrient-rich ingredients provide antiseptic, anti-bacterial, detoxifying and cleansing benefits for the skin. Other ingredients used in this facial may be rose water, honey, lemon juice. Its a great facial treatment in most seasons, especially in summer. Salt is a natural pain reliever. According to Ayurveda, salt can be used externally as a local application for pain. Salt scrub will remove the dead skin and relieve the pain. Shirodhara is a very unique treatment in Ayurveda. Warm oil poured on the forehead is one of the most divine and relaxing therapies one can experience.‘Shiro’ means head and ‘dhara’ mean flow. A healthy glow radiates from the skin after this treatment. Eyes feel relieved and gleam with tranquility. Shirodhara is very helpful for people who are overworked and stressed. It also relieves insomnia. Combination of dry herbs or herbal pastes (Ubtan), salts, flowers, greens, whole grains are rubbed into the skin. Apart from cleansing and nourishing the skin, this process tones the muscles and reduces fat by improving the metabolism of the muscles and adipose tissues. It leaves the skin tingling, soothed and soft. The Shiro-abhyanga-nasya consists of head, face and neck massage, followed by herbal oil drops in the nostrils and herbal steam treatment to relieve sinus congestion. This is an excellent treatment to remove tension from the upper body. Eyes are bathed with medicated herbal oil or clarified butter to release the inner tension of the eye sockets and to soothe the dry wrinkles. This treatment is used to improve eyesight and nourish the nervous system through the eyeball. It brings a glamorous sparkle to the eyes. Netra Basti ends with a short facial massage. This treatment helps in clearing the sinuses and reducing the pain in face, head and neck. It also reduces dark circles and puffy look around the eyes. This therapy is useful for muscle spasms and strengthening the bone tissue of the lower back. Dough of herbal powders is made and placed around the spine of the lower back that looks like a small dam. And then medicated oils are poured in the dam. It involves bathing the back of the neck using warm medicated oil or herbal decoction. It's beneficial in conditions like - Cervical Spondylosis, Chronic pain in the neck region, Compression fractures. In this treatment the knee is bathed in warm medicated oils or herbal decoctions. It promotes the strength of the knee joint by improving the circulation. It's helpful in conditions like - Pain of knee joint, Osteo Arthritis. 7 or more sessions recommended for getting benefit from this treatment. $199 each session when bought as a package of 7 or more sessions. A bolus which is prepared with the shashtika rice (special type of medicinal rice that is harvested in 60 days) along with milk and herbs, used for sudation , is called Navarakizhi or Shastika Shali Pinda Sweda. Treatment starts with abhyanga with a medicated herbal oil. Navarakizhi is beneficial in conditions like: osteoarthritis, joint pain and stiffness, swelling, muscular pain, rheumatoid arthritis, sciatica, cervical/lumbar spondylosis, myalgia. 1. to improve the strength of the tissues of bones and muscles. 2. prevents degeneration of the joint tissues and wasting of the muscles. 3. enhances flexibility and movement of the joints. The heated muslin parcel of aromatic herbs and spices (popularly known as Elakizhi in Ayurveda) is a heavenly Ayurvedic treatment. It is unchanged since ages and is still used to alleviate pain by opening the pores and bringing a medicinal heat to the muscles to induce relaxation. It strengthens and rejuvenates joints, muscles and soft tissues. Helpful in vata related imbalance like: musculoskeletal and neuro-muscular diseases. Combination of Aloe vera detox massage, lavender salt scrub and Aloe vera facial (customized by adding natural ingredients like Add-on oil, lime juice, honey, mango pulp etc.) This package offers perfect detox for the summer. This is a bit rough treatment. Great for Kapha constituion. Includes Gharshana (Dry silk gloves massage), Vishesh (Deep muscular massage, with special medicated oils for cellulite) and Udvartana (deep pressure massage with dry herbal powders), Clay Wrap. This treatment is done on the targeted areas. We recommend that you take multiple sessions to get the benefits. This package includes Far-Infrared Sauna Wrap. Gharshana (Silk gloves exfoliation), Ayurvedic Abhyanga massage and Clean-up facial - all together will make you feel few pounds lighter and floating with musculoskeletal energy. Ayurvedic Massage (Abhyanga) done with Herbal oil is followed by exfoliation with Combination of dry herbs, flowers, greens, whole grains etc. Apart from rejuvenating, cleansing and nourishing the skin, this treatment tones the muscles and leaves the skin soothed and soft. Abhyanga for two, 60 Min $180, 90 Min $270 - Abhyanga is a very beneficial body treatment. Oils and strokes are chosen according to body type and body condition. Some of the benefits of abhyanga are: Reverses, prevents aging and increases longevity · Removes fatigue and stress from work and life overall · Promotes good vision · Nourishes the body and promotes sturdiness· Relieves insomnia. Please note: any gift certificates, issued by us or any third party on our behalf, are not refundable or redeemable for cash and can not be applied towards any discounted services.